Calculating GHG emissions is complex and evolving. We were on track to reach our 2015 target, but in preparation to our GHG emissions inventory verification last year (available on the CDP website), we came across a surprising result: Not only had we exceeded already our goal (we have achieved a 67.5% absolute reduction), but also, we hit that mark two years in advance! What did we do to reduce emissions? To reduce direct emissions coming from on-site fuel combustion (called scope 1 emissions) by 63.4% overall, we did things like replace the remaining coal used at our operations with less carbon-intensive fuel sources. In 2014, we derived 76% of our fuel energy usage from renewables like biomass and relied on lower emissions options like natural gas for almost all of the rest. We also improved our manufacturing processes to optimize energy efficiency, which factors into the reduction of our total indirect emissions (scope 2) from purchased electricity and steam by 70%. Although 68% of our electricity came from renewable and low-carbon sources like hydroelectricity and cogeneration in 2014, projects to reduce electricity consumption still had a big impact. The protocol for calculating GHG emissions takes into account a number of factors. And these factors can vary by region and over time. You need to regularly calculate using the most up-to-date information provided by governments or industry partners to obtain accurate results. For example, the emissions factors for the past year from electricity suppliers like the local power plants are updated each spring. So in 2014, we learned that our 2013 emissions were lower than we had previously expected. Basically, as the power plants we buy from get greener, we reap some emissions reporting benefits. When we completed and externally verified our calculations with the latest emissions factors information, we found that this significantly lowered our final GHG emissions totals for 2013, compared to the estimates published in our Annual Report (that relied on the old emissions factors). Now here we are, two full years ahead of schedule! Overall, about half of our impressive GHG reduction achievement was the result of reducing overall production and about half was from reducing the intensity of emissions for the products we make. The scope 2 emissions factor updates had a small (8%), but positive impact on our total emissions reduction. Was our reduction target simply too easy? No. When we talk about that 65% GHG reduction being a leading target, it is backed by a lot of research. That’s because it is absolutely essential to WWF’s Climate Savers program that its partners set targets that place the company ahead of its competitors in terms of reducing GHGs. There are a lot of phases to becoming a partner in Climate Savers and the process of working together through those phases is what shapes the commitment. So, is that it for GHG emissions then? Hardly. This is just the start. 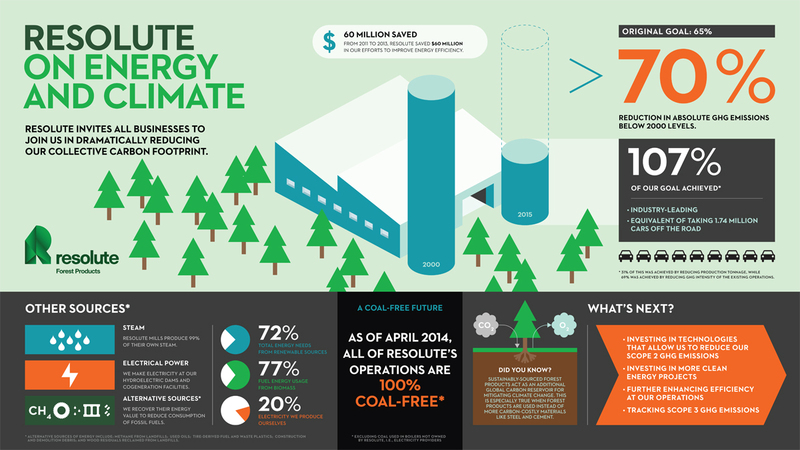 One of our big goals is to start tracking and reporting our scope 3 GHG emissions in 2015. Scope 3 covers supply chain emissions that can have a big impact on our company’s carbon footprint, for example emissions from the production of purchased materials or transportation activities not controlled by the company. Even though we’ve met our ambitious goal, we are still looking for ways to improve energy efficiency. It’s a great example of what’s good for the environment can also be good for business. 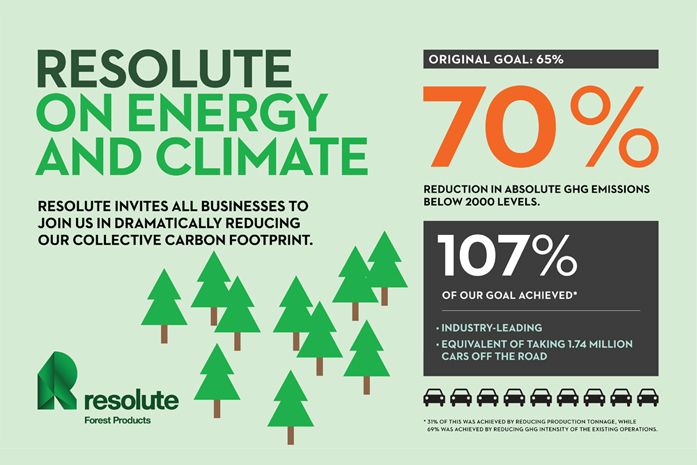 Reducing our GHG footprint also delivers important value to our bottom-line. Energy accounts for about 23% of paper production costs, so reducing the quantity of fuel we purchase as we become more energy efficient helps our bottom line. Energy efficient production means that we also benefit by staying ahead of potential regulations, positioning our company for carbon credit sales, and targeting sustainable product markets to serve customers who want to reduce their environmental impact. What about other sustainability priorities? Aside from GHG targets, our participation in WWF’s Climate Savers program also includes commitments related to sustainable forest management certifications, developing products with a lower carbon footprint and implementing tracking systems for forest biomass used for energy purposes, among others. Not to mention our own ambitious, publicly-stated goals that are included in our annual reports and online. When it comes to fiber and forestry, 100% of the woodlands Resolute manages are independently certified to at least one of three internationally recognized sustainable forest management standards: Sustainable Forestry Initiative® (SFI®), Forest Stewardship Council® (FSC®) and CSA Group (CSA). In addition, every one of our North American manufacturing facilities has fiber-tracking systems, all of which are third-party certified to one or more of three internationally recognized chain of custody (CoC) standards, namely SFI, FSC and the Programme for the Endorsement of Forest Certification (PEFC).